When Snickers was considering its Super Bowl ad options in 2010, Betty White almost didn't make it. The brand's agency, BBDO, had actually recommended going with Aretha Franklin. "She was the bigger star," recalled David Lubars, BBDO's chairman and chief creative officer for North America, at the Association of National Advertiser's annual conference in Phoenix. Ms. White, of course, made the final cut at the urging of brand-owner Mars, launching a comeback for the comedic star, as well as the Snickers bar. During a dual presentation at the ANA, Mr. Lubars and Mars Chocolate North America President Debra Sandler gave a behind-the-scenes look at how the wildly successful campaign came together. The seeds were planted many months before the Super Bowl ad, when Mars decided to launch a global campaign for the brand, which had been relying on a regional approach. "Peanut power was always at the heart of the brand," Ms. Sandler explained. But Mars wanted to give Snickers a more emotional appeal by taking a "storytelling" approach. The result was the "You are not you when you are hungry" campaign, which portrayed Snickers as "the bar of substance that sorts you out," she said. The Betty White spot, in which she appears as a football player who is "playing like Betty White," went viral, generating tons of free media for the candy bar, while marking a comeback for Ms. White, who went on to appear on such shows as "Saturday Night Live." The buzz created just the kind of momentum Mars was looking for as it spread the campaign globally and regional brand teams called for similar ads. The campaign is now running in more than 80 countries. But as Ms. Sandler and Mr. Lubars explained, the Snickers team allowed local markets to adjust the ads, using their own celebrities. "When each region gets to do their own executions ... then they feel an ownership of it," both at the agency and brand level, Mr. Lubars said. Back in the states, the Aretha Franklin ad -- which was shot at the same time as the spot starring Ms. White -- eventually ran. (It also starred Liza Minnelli.) Snickers has since tapped a range of celebrities for the spots, including Robin Williams. And the candy bar, meanwhile, is on the verge of becoming a $1 billion brand in the U.S., Ms. Sandler said. Creating global communication platforms is a tricky business. Creating ones that endure and are celebrated for their creativity and effectiveness is trickier still. Over the past six and a half years, Snickers’ "You’re not you when you’re hungry" has won awards at every major creative gathering, including Cannes Lions, The One Show, D&AD and the Emmys. It has also scooped every major effectiveness award, including two Effectiveness Lions, an IPA gold, and global and local Effies and AME Awards. In its first full year, "You’re not you when you’re hungry" helped increase global sales of Snickers by 15.9% and grew market share in 56 of the 58 markets in which it ran—not bad for an 80-year-old, billion-dollar brand. Here we offer our thoughts on why this campaign has been so successful. We will explain how focusing on effectiveness from the outset shaped our approach and, ultimately, helped us deliver a celebrated, global creative platform. From 2007 to 2009, growth for Snickers lagged behind other global chocolate brands, both in relative and absolute terms. Snickers was growing, but losing market share. Projections showed that if it remained on the same trajectory, the brand would lose its position as the world’s leading chocolate bar. Therefore, we identified three opportunities to improve effectiveness across marketing and communications. 1. Create a bigger, more compelling creative platform. Achieving this would accelerate growth and help inspire all markets—particularly our "long-tail" of small markets—to unlock creative work with greater impact. 2. Create greater internal engagement and commitment. If we could get marketers across the globe aligned around one idea, Snickers would begin to feel like a truly "iconic," global brand, which would boost the engagement and commitment of local marketers. 3. Drive efficiencies of scale from a more global approach. Mars is a decentralized organization, however, it was noted that many FMCG companies were achieving efficiencies of scale from a more focused and global approach to brand and communication development. Start with a view on how communication would build the business. 1. Memories are fragile - people are constantly on the verge of forgetting about your brand. 2. Brands are substitutable - all categories are repertoire categories where people choose from a range of different brands that can comfortably meet their needs. 3. Penetration is king - growth comes from attracting more buyers into your brand. Chocolate is an impulse category. At any given purchase moment, a consumer is presented with anything from ten to 100 brand options. If you want to be the brand that people reach for, you need to be immediately recognizable. So we needed a communication platform to work with that would enable us to build distinctive brand assets across all touchpoints. Growth comes from increasing penetration. Up until 2010, half of all people who bought a Snickers bar during one year wouldn’t buy one the next. So on the basis of this, Snickers needed to replace half of its buyers every year just to break even. The reason behind the hiatus in people’s Snickers-buying habits wasn’t because they didn’t like the brand or had suddenly developed a peanut allergy, it was because they simply didn’t think of the brand or see it when they went into a store. So we needed a communications platform that would be noticed, distinctive and drive salience for Snickers. Growth meant attracting new buyers and reminding those who may have taken a one-year break that it was time to have a Snickers bar again. To do this, we needed a communication platform with broad-based appeal. Success would come from being salient and immediately recognizable among an incredibly broad audience. In short, it seemed we needed to be famous. "Fame is not simply about generating brand awareness (which turns out to have limited value for most established brands). It is about building word-of-mouth advocacy for the brand—getting it talked about, creating authority for the brand and the sense that it is making most of the running in the category." Everyone already knew Snickers, so we didn’t need simple brand awareness: we needed fame. To confirm our thinking, we undertook an analysis of Snickers’ historical penetration and market share data. We also dug into Peter Field’s analysis of the IPA database. We concluded that driving fame—in particular, getting more and more people talking about the brand—would deliver penetration growth and drive sales. Taking a step back, we looked at the work we were creating around the globe and quickly realized that it did not reflect our analysis of how communication would grow the brand. We discovered that, over time, the work had become too targeted—focused exclusively on a young, male audience—and too niche in its appeal. We needed to think about Snickers as an iconic US brand with wide appeal, such as Budweiser, Jeep or Levi’s. We determined that the most important influence in driving fame was to have universal meaning. Whether you are a celebrity working in film, TV or another industry, the key to success is ensuring that everyone can connect with you. This seemed particularly relevant for Snickers, given that just about everyone buys chocolate. We began by looking at Snickers’ core make-up. There was a distinct male tone defining much of the brand’s past. This had been pushing us toward targeting men using very "blokey" humor. We couldn’t ignore or walk away from our past but our new approach meant finding an insight and a story that would connect with everyone. We needed to find a way to tell a guy’s story in a more universally appealing way. As David Lubars, BBDO’s global chief creative officer, put it: "We need to be more like 'Knocked Up' and less like 'Jackass.'" Qualitative research identified an interesting insight: that there is a universal code of conduct by which men abide to stay part of the male pack. This was globally consistent among men, but also something that everyone could recognize or identify with; it’s the sort of relevant insight on which films such as the aforementioned "Knocked Up" or "The Hangover" rely to achieve popular appeal. Our creative team found a brilliant way to link this insight into male pack behavior to our brand and "product truth." They distilled the thinking into a universal human truth: when you’re hungry, you’re just not yourself. And, when you’re not yourself, it has a real impact on your ability to remain part of the pack. Whether you become cranky, weak or dopey, there are universal "symptoms" of hunger that can prevent a man from living up to the "male code." But you don’t have to be a guy to recognize them. And, of course, Snickers, the substantial, nut-filled bar that has always been known for satisfying hunger, is the perfect antidote. "You’re not you when you’re hungry" was the right expression of our platform: when you’re hungry you’re not on your game. Snickers is the bar of substance that sorts you out. The commonality of the human truth and the simplicity of the platform made it feel as if it was ripe for widespread adoption. But before we could ask markets to adopt it, we had to be clear as to how we would drive fame. To deliver global fame there seemed to be two options: go global and aim for scale or go local and aim for engagement. Looking at the three opportunities we had identified for more effective work (better creative work in all markets, engaging local marketers and efficiencies of scale), the two we chose to prioritize were local engagement and better local creative work. Mars is a decentralized organization. We believed that markets would be more likely to embrace a new global platform if they could make it their own. We also took the view that if fame and getting people talking about the brand was our goal, then brilliant local executions of a global idea would better help us to drive local fame and word-of-mouth. We were confident that "You’re not you when you’re hungry" was so universally relevant and compelling that we could inspire markets to quickly take up the idea and make it famous. The US was the launch market and the team there developed the creative platform, working from the global brief. As the US is the No. 1 market for Snickers, getting it right there was critical to our global ambitions. Early on, a decision was taken to launch during the 2010 Super Bowl. This was a brilliant statement of intent from Mars, perfectly reflecting its ambition for Snickers. There is no bigger media event in the world for driving fame. 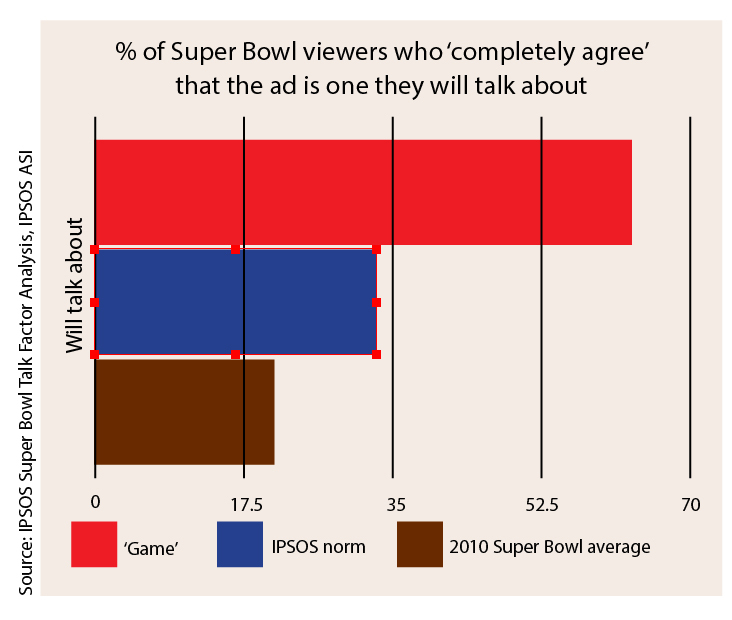 With its massive audience and live-viewing experience, the Super Bowl is an environment that rewards populist work and generates huge amounts of conversation in both mainstream and social media. We could not have hoped for a better launch. 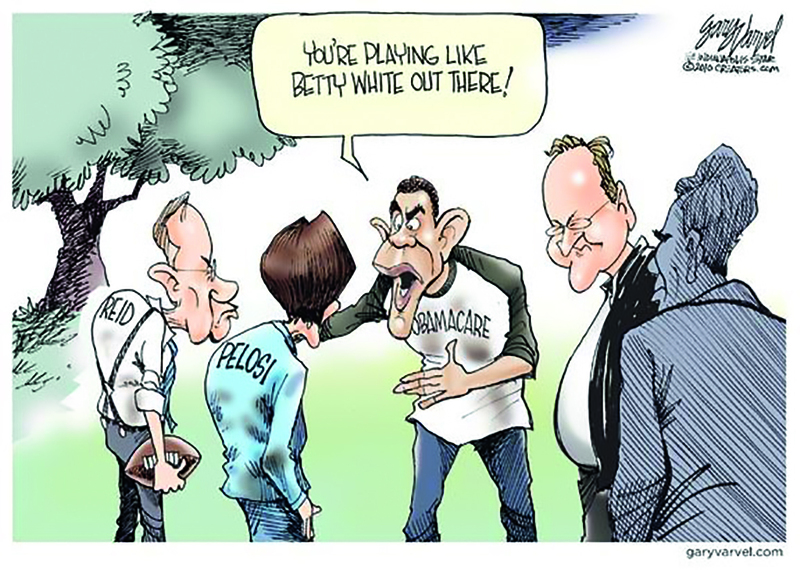 "Game," featuring US actress, comedian, TV personality and author Betty White, topped the USA Today poll as the No. 1 Super Bowl ad. It prompted such a groundswell of enthusiasm that, ultimately, we received more than 91 days of media coverage from one 30-second ad. In total, the ad generated 400 million incremental and unpaid media impressions with a media value equal to $28.6 million—11.4 times our initial investment. We were famous. The sheer variety of follow-up coverage was testament to the platform’s populist appeal. White appeared on TV shows including The Jay Leno Show, The Oprah Winfrey Show, Larry King Live and The Ellen DeGeneres Show, and during each of her appearances the ad was played. The spot rekindled enthusiasm for White and, in the excitement, an online petition was set up to get her to host the US comedy show Saturday Night Live, which she did. Beyond that, the ad worked its way into popular culture appearing in political satire and, later, memes and tweets. Subsequently, data confirmed this fame was the result of all of the additional conversation around the campaign and the brand. So, armed with a universal human truth, a clear creative platform and the successful launch of "Game" in the US, we turned to other markets to embrace the campaign. TV was our most important launch media across all markets. It was the best rocket launcher for a campaign looking to generate fame and be talked about. We approached local markets and encouraged them to adapt the campaign to generate local fame. The ads used local celebrities who embodied a certain hunger trait and set them in male-pack-type situations. This provided the flexibility to tailor executions by market, which raised the chances of local fame but not at the expense of a consistent global story. As the chart below demonstrates, we achieved global buy-in to the platform. Over time, work has been produced for all Snickers’ key markets using a range of local celebrities and locally relevant "hunger symptoms." The ultimate measures of effectiveness are volume, value and profit. To give you a sense of whether your communication is working as you intended or expected (assuming you agreed at the outset how communication would drive the business), it is important to look at interim measures, more directly linked to communication. "The work was big, populist and famous, which got people talking about the brand"
For Snickers, we said the campaign would work by driving fame and getting people talking about the brand. This would drive penetration, which would in turn increase sales. So we tracked fame by looking at how the campaign was driving awareness and earned media, and how it was entering culture by getting talked about and shared. We tracked penetration, as we know this correlates to market share and volume growth. And we tracked our distinctive assets to understand which ones we were building and which would help us best achieve brand recognition. We also tracked internal engagement as it is a key indicator of the likely success of such initiatives. As new markets adopted the platform, we saw it work in much the same way as it had in the US. The work was big, populist and famous, which earned incremental media and got people talking about the brand, further boosting fame. Russia, the second-biggest market for Snickers, was one of the first to adopt the campaign. This was a big step as Snickers was already the most-famous chocolate brand in the country, with a long history of well-loved local ads. The Russian launch of "You’re not you when you’re hungry," featuring Russian ballerina Anastasia Volochkova playing basketball with a group of men, generated immediate fame and conversation. The first ad generated more than four times as many earned-media placements as the previous campaign. At launch in China (another critical market), we generated more than $1.1 million in earned media for a brand that had previously made little impact in the Chinese media or popular culture. In market after market the campaign generated fame through earned and social media and by entering popular culture. As more markets adopted the campaign, sales growth for Snickers accelerated. 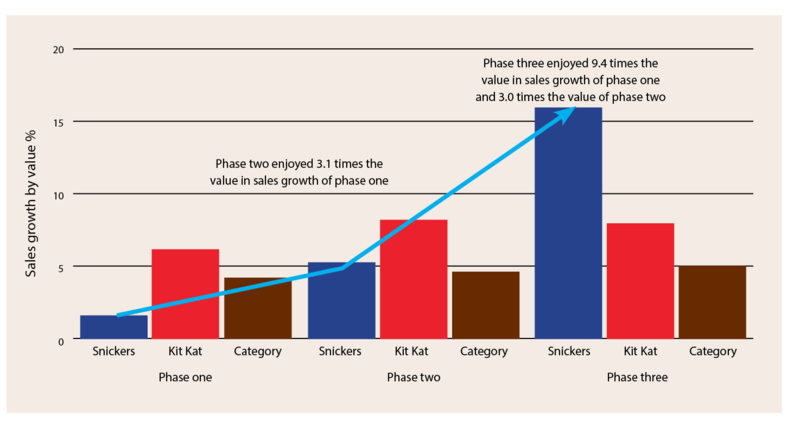 In the chart (below), phase one covers the period before the launch of "You’re not you when you’re hungry," when Snickers’ growth lagged our No. 1 competitor and the category, generally. In phase two, 34 markets—representing 49% of Snickers’ global value—were running the campaign. Sales growth was 3.1 times higher than the previous period and finally ahead of category sales. And in phase three, about two years after the launch of the campaign—with 58 markets representing 88.7% of global sales running the campaign—Snickers was growing at 15.9%, 9.4 times the rate of growth in phase one. Snickers’ growth was significantly outpacing our nearest competitor and the category. One of the other measures of effectiveness we tracked was local market engagement. If local markets felt engaged, it would translate into better in-market execution and ultimately higher growth. Eighteen months after launch, 93% of Mars marketing directors felt Snickers had a real sense of momentum, versus just 43% before launch. Furthermore, 96% felt that "You’re not you when you’re hungry" had been "significant" in terms of driving business success, and confidence to invest in the brand increased by 25% points to 96%. The impact of the campaign platform, its rapid global adoption and high local market engagement helped the sales of Snickers to increase by $376 million during the two-year period from 2010-2012, regain market share and bolster its position as the world’s foremost chocolate bar. While TV was key early in the campaign and remains critical, in today’s media environment fame is increasingly built across earned and social media. "You’re not you when you’re hungry," a platform built on a human truth with the ambition to drive fame for Snickers, was practically purpose-built for today’s media environment. As Snickers’ winning paper at the 2015 APG Creative Strategy Awards convincingly argues, it enabled Mars and BBDO to create communication ideas that drove fame, but was also so clear and compelling that it inspired the public to help build and tell the Snickers story. The UK was one of the last markets to adopt "You’re not you when you’re hungry," so we decided the campaign should be launched in a fresh way using Twitter. Five celebrities sent four out-of-character tweets, before revealing in a fifth tweet that they had been hungry and needed a Snickers. This was a world-first in the use of Twitter, and even prompted the UK’s Advertising Standards Authority to rule on its legality (it was deemed to be legitimate). National newspapers picked up the story and a campaign of just 25 tweets reached more than 26 million people. It became so high-profile that it prompted a question in the House of Commons three days after the first tweet. The UK campaign has continued to pursue fame with ongoing topical and timely tweets, such as one related to Jeremy Clarkson’s infamous dinner-related fracas with a producer. 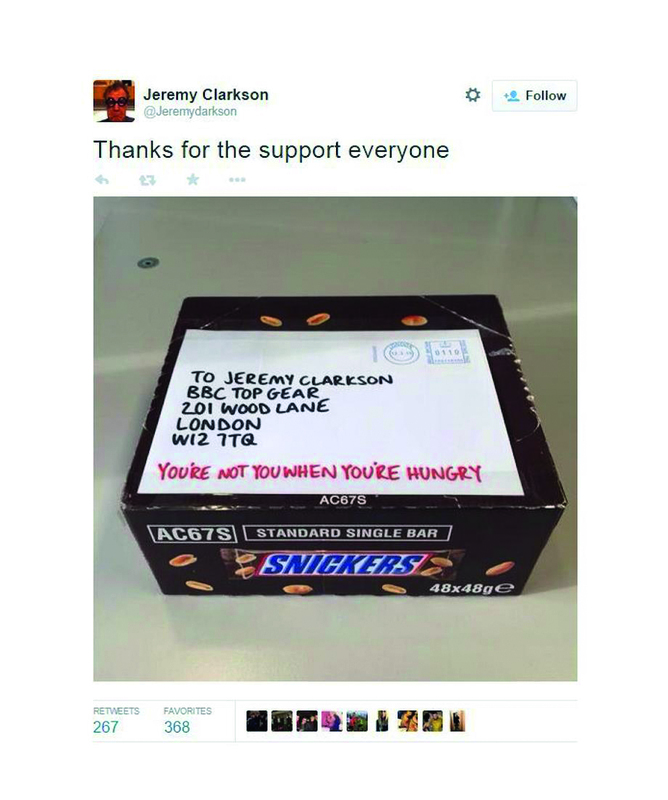 For the cost of a box of Snickers, the activity generated 5,000 retweets and 390,000 media impressions. We even had a friendly response from Clarkson himself (right). In Australia, Clemenger BBDO produced an online video to drive fame beyond TV. Its "Aussie builders" campaign showed a group of workmen acting "out of sorts" on account of their hunger. Playing with the stereotype of traditional builders proved somewhat controversial, but popular. In two weeks, the film generated more than 238 million global media impressions, and news and TV coverage generated more than $11 million in free media. In Puerto Rico, we had the most popular breakfast DJs around the country play out-of-character music—for example, classical on a hip-hop station and opera on a rock channel—until an announcer stepped in to reveal that the DJ was clearly hungry and needed a Snickers. This campaign activity reached more than 3.2 million people. In the US, we used the platform to drive fame in media channels as diverse as Twitch, Twitter, Sports Illustrated and on parking lots. The idea was also extended into on-pack promotion, through a "Hunger Bars" activation, whereby people were encouraged to "gift" any of a selection of Snickers bars labeled with "hunger symptoms" to friends suffering from a "hunger breakdown." The campaign continues, with ‘"You’re not you when you’re hungry" work being created across all channels by BBDO offices from Brazil to China, and from Germany to Dubai. But the public has also taken up our platform and helped to tell the story in their own way. From tweets to memes, and with recreations of our ads posted to video sites, the campaign has become part of popular culture, which, again, only helps to grow our fame. Effectiveness is not something we evaluate only on an annual basis or when the time comes to write an Effie or an IPA paper (although that does focus the mind). One way Mars tracks effectiveness is via single-source sales data in key markets. For proprietary reasons, we are unable to go into detail, but suffice to say we know whether our work is having a direct impact on sales and the magnitude of that impact. We review those results regularly. If work is having a positive impact in a market, we continue to invest in it. If it is not having an impact, we withdraw the work and back previously proven work instead. This approach allows us to ensure that we are minimizing wasted media spend and maximizing our investment in effective activity. This means we are driving efficiency and boosting effectiveness on an ongoing basis. Moreover, as we push further into digital with constant, real-time feedback, we will embrace the opportunity to measure and improve our effectiveness in an ever-more timely fashion. One of our areas of real focus and excitement from an effectiveness perspective is digital commerce. Programs include Snickers "Hungerithm" in Australia, which monitors the mood of the internet and offers discounts on Snickers from 7-Eleven stores when the internet is "hungry." In China, meanwhile, there is Snicker Gaokao, a program with Tencent built around exam time when everyone gets hungry. Initiatives such as these will allow us to track not just interim communication measures but real-time sales—the final measure of effectiveness. Over the past six and a half years, Snickers has made "You’re not you when you’re hungry" a famous global platform one market at a time. There is no rest, though. Having driven engagement and brilliant local work, we are now looking at ways to fuel greater efficiency with the platform through work such as "Mr Bean," which has run in 60 countries already. We consistently challenge our communication model and our measures of effectiveness to ensure we are pushing ourselves to get the most we can out of this platform. A relentless focus on effectiveness from the outset right up to today has enabled "You’re not you when you’re hungry" to become one of the world’s best loved and most celebrated campaigns.